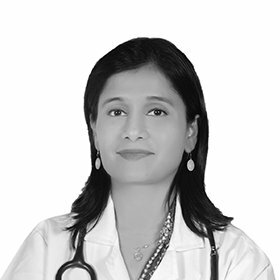 Dr Anumeha Prasad did her MBBS from the prestigious Topiwala National Medical College and Nair Hospital, Mumbai, India. She completed his MD Obstetrics & Gynaecology from DMCH, Darbhanga, India. Thereafter, she worked at India Security Press Hospital, Nashik and as a Consultant Gynaecologist at Suvidha Hospital, Nashik. She worked as a Director and Consultant Gynaecologist at City Care Hospital, Nashik from Feb 2011 till April 2016. Till date she has successfully conducted more than thousands deliveries which includes both Normal Vaginal and Instrumental deliveries. She has managed high risk pregnancies like Pre-Eclampsia, Eclampsia, Placenta Previa, Diabetes and Heart disease with Pregnancy. Dr. Anumeha has performed high order Caesarean sections and is highly skilled in dealing with sensitive issues like recurrent miscarriages, missed abortions and bad obstetric histories. She has performed multiple Gynaecological surgeries and has special interest in Infertility management. She is soft -spoken and can handle patients belonging to multi -ethnic and culturally diverse environment.